The Muradiye Mosque was founded in 1435 by Murat II. It was, together with the Tekke (monastery) an important centre of Dervishes following Mevlana. I took pictures in different times of the year, on different media, and in December 2009 added pictures with some of the gypsy girls who tried to show me around (but at that time found the mosque closed). 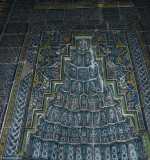 This is a new sub-gallery I decided to create after taking many new pictures in 2017 of - mainly - the wonderful tiles in the mihrab of this mosque. I hope to return with a better camera and natural light.